Most electrostatic powder spray coating systems are comprised of four basic pieces of equipment – the feed hopper, electrostatic powder spray gun, electrostatic power source, and powder recovery unit. A discussion of each piece, its interactions with other components, and the various styles available is necessary to understand the functional operation of this process. Powder is supplied to the spray gun from the powder feeder unit. Usually powder material stored in this unit is either fluidized or gravity-fed to a pumping device for transport to the spray gun(s) (Figure 5-9). Newly developed feed systems can pump powder directly from the storage box. Figure 5-9. 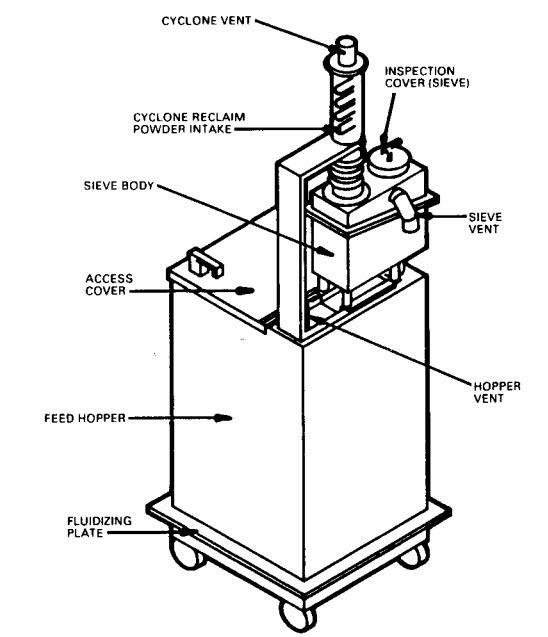 Typical types of powder feed devices. The pumping device usually operates as a venturi, where compressed or forced airflow passes through the pump, creating a siphoning effect and drawing powder from the feed hopper into powder hoses or feed tubes, as shown in Figure 5-10. Air is generally used to separate powder particles for easier transporting and charging capabilities. Volume and velocity of the powder flow can be adjusted. In most cases, the feeder device utilizes either air, vibration, or mechanical stirrers to aid in “breaking up” the powder mass. This action results in much easier transport of the powder, while assisting in regulating the volume and velocity of the powder flow to the spray gun(s). Independent control of powder and air volumes aids in attaining the desired thickness of coating coverage. 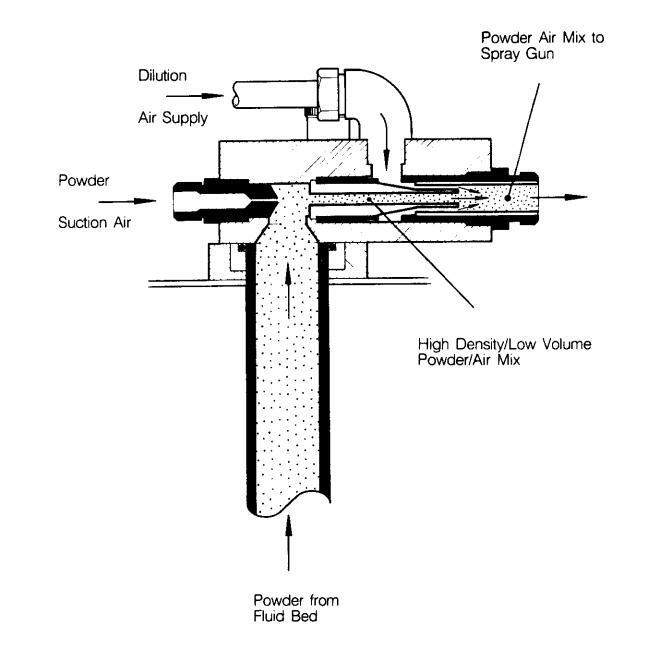 The powder feeder is capable of providing sufficient material to one or more electrostatic spray guns several feet away. 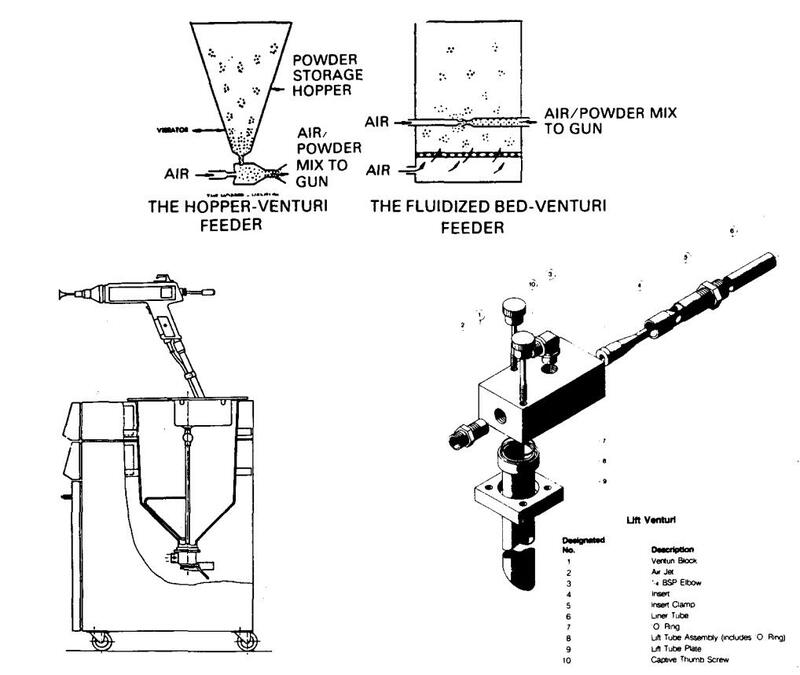 Powder feeders are available in many different sizes, with selection depending on the application, number of guns to be supplied, and volume of powder to be sprayed in a specified period of time. Generally constructed of sheet metal, the feeder unit can be mounted adjacent to, or even be an integral part of, the recovery unit. Feeder units, which utilize fluidizing air to facilitate pumping of powder material to the spray concept. Compressed, or forced, air is supplied to an air plenum generally located at the bottom of the feeder unit. Between the air plenum and main body of the feeder unit is a membrane, usually made of a porous plastic-composite material. Compressed air passes through it into the main body of the feeder unit, where powder material is stored. The fluidizing action of the air results in lifting the powder material upward, creating an agitated, or fluidized, state (Figure 5-2). With this fluidizing action, it is possible to control the metering of powder siphoned from the feeder unit by the attached, or submerged, venturi-style pumping device (see Figure 5-9). When gravity feed-type feed units are used, the operation involves a conical or funnel-shaped unit in which powder material is stored. Pumping devices attached to this type of feeder unit usually are of a venturi-type pump. In some cases, vibration or mechanical stirrers are used to enhance powder siphoning by the venturi effect produced by the pumping device. Powder is gravity fed to the pumping devices, and fluidizing of the powder is not necessary. Again, see Figure 5-9. Powder may also be delivered directly from powder boxes or containers using a double-well siphon tube, which provides enough local fluidization to allow uniform delivery. Sieving devices are sometimes used in conjunction with feeder units to screen out any dirt, clumps of powder, and other debris, and to condition the powder prior to spraying. These sieves can be either mounted directly to or above the feeder unit to facilitate easier flow of powder within the closed loop of powder delivery, spray, and recovery (Figure 5-1 1).